As usual, it’s a good one. And if you’ve heard Amy talk before (like at TCCIRL last year), you know she always brings her A-game. To get this one in your ear buds, simply download it to your favorite podcast app. Or click the play button below. For a full transcript, scroll down. Kira: What if you could hang out with seriously talented copywriters and other experts, ask them about their successes and failures, their work processes, and their habits, then steal an idea or two to inspire your own work? That’s what Rob and I do every week at The Copywriter Club Podcast. Rob: You’re invited to join a club for a special unnumbered episode (UPDATE: episode #120) as we chat with direct response copywriter and copy coach, Amy Posner about her coaching program The Copy Clinic, how her business has changed since we spoke with her more than 100 episodes ago, how to build authority and what it takes to write great copy today. Amy: Hey, thanks for having me. Kira: Yeah. It’s great to have you back. It’s about time. Why don’t we start with what you’ve been up to since you were last on the show over a year ago? Amy: It’s sort of shocking that it was that long ago. Well, I think that’s a lot. My copy business has morphed considerably. I stopped taking on super big projects. I guess the beginning of this year, the beginning of 2018, I still love these really big complex projects that were 20, $30,000, lots of moving parts, a long time to complete them, but I’d usually do a couple of them overlapping. It just got to be too involved for me. It was too complex and it was too long, and I wanted to do things that were a little bit shorter and a little bit more repeatable because all those kinds of things are usually custom one-off projects. I started doing streamlining, what I was doing in terms of client projects and in the meantime what happened last year I ended up coaching The Copy Hackers Mastermind, Copy Hackers Mastermind 3, over the summer when Joanna was away and that morphed into me coming on as the co-coach for her 10X freelancer course and then that morphed into me being the co-coach in The Copy Hackers Mastermind 4 which is, I guess, we’re three months into it. It’s a six-month program or four months, whatever, that ends at the end of this year. From all of that coaching has come … We’re private coaching because people came to me from those programs and asked for help for specific things. Then I ended up launching my own group coaching program, Copy Clinic. Things have changed just really significantly. I’m doing different work than I was doing a year ago, I guess, for the majority of my work time. Kira: Can you just talk to us more about why this big pivot? It sounds like you were just maybe tired of those big projects which can be overwhelming, but this is a big change in your business so what really triggered it? Amy: It’s a good question. It’s so funny this entrepreneurial journey, and I’ve been on it a long time. I just find it … At least if you stay open things change. Different opportunities are presented. You see things differently as you grow and change. I think I really wanted just a change in my work and in my lifestyle. I hate to use that word but what I realized, and I guess this is probably true for a lot of us but I work for myself and I’m my own toughest boss. I just don’t give myself enough time and enough breathing space. I’m always feeling like there’s something else I should be doing or ought to be doing. I realized at one point, I don’t want to be living my life that way. This is not what I want my day to day existence to be, and if I don’t, it’s up to me to control that. It’s really hard. I guess I’m a little bit of a workaholic. I’m not a perfectionist but I really like to go the extra mile. I’m trying to find what fits my life so that I can have a more sane life. I’ve got some different plans for that even to evolve that into the next year as I’m getting clearer and clearer. Really, that’s what precipitated is wanting to have more time to do other things in life. Rob: I want to talk a little bit about this specific move and what it has involved because I think we all have a really good sense of what the job of a copywriter entails and the things that we’re doing every day, but the shift to coaching other copywriters seems pretty different. Will you tell us what are the things that you’ve been doing as a coach in all of these different programs that you’ve been working in? Amy: Well, it’s interesting. People seem to come me for two things primarily. One is for copy review like, ‘Can you look at this? Tell me if it. Does it work? What does it need? Is it strong? Is it weak?’ The other thing people that come to me for is client, what I call client wrangling. Someone threw that out, and I liked it so I kept it, which is dealing with all kinds of things client related. Everything from, ‘I helped someone this week with correspondents, with a job she’s trying to land and had to finesse the conversations with her client. Other people come to me about pricing or I want to break into this copy or I want to do this kind of project. Do I have the skills? Can I do it?’ So, all kinds of things. A lot of times its client problems and challenges. It’s how to be a business person in a sense. Rob: You and I, and Kira, we’ve talked many, many times over the last several months and so I have a sense of what you do, with the client wrangling and some of those conversations. You even talked about it at our event. I have a sense of that, and maybe we can continue to talk about that even more deeply. Kira: Yeah. I’m curious about the mindset, Amy because letting go of big copy projects is challenging for many of us. I mean, I’m dealing with a similar challenge. I also feel like our ego is attached to these big projects like, ‘Oh, I can take this on, and I can handle this, and if I let those go, and make a shift, and pivot, then maybe that says something about me that I can’t do that.’ Did you have to deal with any mindset shifts as you’ve made these changes over the last year? Amy: Yeah, I’m still dealing with it. The position that I’m in right now is not a good one. I’ve said yes to too many things. I just wasn’t careful enough about it. I am in that mindset thing of realizing that it always comes back to being accountable to yourself because you’re the business owner and it’s your life and your business. I find it incredibly difficult to turn down money. I just do. I like money. I like making money. Rob: So easy for us to say no to money, but yeah. Amy: Yeah, right. I know. What you all do. It’s really hard to do. Kira, I don’t know for me if it’s so much like the ego thing of landing the big projects. Maybe it would have been earlier on but the novelty of that world, but it’s kind of … There’s two things. One is, I really like helping people and some of these projects that show up just sound cool. They sound like they’d be really interesting and I like the people, and I want to help them. That’s one piece of it. The other piece for me is that I spent so long building my reputation, and now I’ve got this great flow of inbound leads, so it feels like a bad business move to let go. But what I realize I’ve come to think of it differently. I can actually share those, help other people and that helps me in a less direct way, and that it’s more like what goes around, comes around. That’s my theory. I haven’t put it into practice yet so get back with me in a couple few months and I’ll tell you if that works. I’ve put some things in place for accountability that I have to hold myself to say no. I’m not taking any more projects for the rest of this year. Kira: I love to hear more about the pivot. Your pivot is unique to you. Some other copywriters may make a similar pivot but we all at some point make a pivot in our business. It’s almost like getting a promotion in the corporate world except we have to promote ourselves now. For a copywriter who’s making some type of pivot, can you offer some advice as far as what has worked for you over the last year or more that you’ve made this pivot and then also what hasn’t worked as well, some of your struggles along the way which you’ve mentioned a couple already. Amy: I think the most important thing, and this is probably true for a pivot or even for day to day is to make a plan and detail it and follow it, and trust yourself. You can take little pathways off of your main road of your plan. We hear about this all the time and it’s not just copywriters but being distracted by shiny object syndrome or squirrel, ‘What’s going on?’ Get to the next thing. I think some of that is our culture, but I think it’s also talking about mindset. I think it’s a little bit insecurity. We’re looking around and it looks like everyone is doing things better and faster and bigger. I make this pivot and decide I’m going to go over here, but then I see you doing this, and I’m like, ‘Oh geez, I’m curious doing that. Maybe that’s what I should be doing.’ I get this sense of panic or insecurity. I see that a lot in people. I think if you make a plan, talk your plan over with somebody who you respect whose business you respect. Make sure it’s a good plan and then stick to it. It’s not easy like it’s not easy saying no if that’s part of your plan for example. Building some ways to do it. They don’t all have to be punishing. Reward yourself. Hey, if I say no three times, I get to go for a meal at my favorite restaurant. I mean, it’s stupid but it works. Kira: That’s a good idea. Amy: Just build some things in. It’s so much easier to do the opposite and beat yourself up for what you’re not doing, but if you can be kind to yourself and make a plan and stick to it. I think it sounds so mundane but I think that’s how you build a business. I really do. I really do think that. I can say it because I haven’t always been really good at that, so I’ve seen when I have done it. It works really well. When I get distracted, not so much. Rob: I think we’ve seen this in a lot of other businesses that we’ve seen, and with people in our Think Tank, and in the group, in the Facebook group, people who are trying to start courses or do interesting things in the business. It’s just a matter of just getting started, maybe having the goal and then pulling the trigger, moving forward. Rob: Let’s talk about Copy Clinic. What is The Copy Clinic and what are you doing inside there to help other writers? Amy: Copy Clinic, it’s an interesting program. It’s morphed since it started. It’s a group coaching program. I think it started … It’s been about five, six months then, five months? It started as a copy review program and the idea was that people who are writing copy for their clients would submit their copy each week, and I would mark it up and make comments, and then we’d meet. Well, we meet several times a month and we would discuss those copy changes or the potential changes and ideas. We would talk about headlines and leads and copy principles. Usually we’re doing in isolation. Mostly people still are but when they bring it to Copy Clinic, we can talk about those things as long as they’ll bring it at the beginning of the project or even during a project and we’ll talk about what they’ve got or how it could be better or maybe how it should be different. There’s a lot that happens when you talk about the copy. I think it also increases confidence because as you talk about it, you start to see how these ideas come together. That’s what we’re doing now. The other things that I introduce a couple of months in was this client wrangling piece because we have a pretty active slack group and people were asking client questions in the copy sessions so now we’ve morphed The Copy Clinic into doing a little bit of copy review using the copy review to jump off and talk about copy principles that people are also bringing their client questions like anything from proposals or how to write proposals, and scoping to this person didn’t like my work or thought I needed to do this or that. How many ways can I say this or do that? It’s morphed into a mix of copy learning, copy critiquing, and client wrangling. That’s a lot in one program. Kira: Right. It’s hard to talk about just the copy without talking about the client behind the copy too. Amy: Yeah, that’s a good point actually. Kira: What surprised you the most about this program so far? As far as even running it or success stories, what copywriters are dealing with, the biggest challenges? What comes to mind? A lot of headline in hero sections are like that. Even the first block of copy under that. It would almost be like, ‘You’d read it, and you’d feel that sense of … ‘ This isn’t going to work. What would happen, and this is what would surprise me is almost invariably, a really good headline and lead was buried. Usually it was in the top third or the top half of the copy. You’d be reading through it and getting more interested in it. All of a sudden, it would feel like all throat clearing stopped and the copy has started. What’s good about that is the real copy is there. What’s bad about that if you don’t have somebody looking at it is you might be putting copy out there that no one is ever going to get to, what the real media is because you’ve got … Your first part is always a necessary throat clearing. That’s amazed me. I would say 80 or 85% of the time we find that in the copy that people bring. These are good copywriters. These are really talented people. This isn’t like a bad thing or something they haven’t learned. It’s almost like you haven’t learn to get rid of that piece yet. Rob: You guys also do some monthly trainings in The Copy Clinic as well. It’s not just review of copy or talking amongst yourself. I know I’ve been in there to teach a little bit. Kira has been in there, and you’ve had some others as well. Will you tell us a little bit about that? Amy: Yeah. Last month we had Val Geisler speaking about email and email onboarding sequences that she does for SaaS and what she’s done and how she’s evolved her business. That was super, super insightful for people, just really, really helpful. We’ve got a couple of interesting things coming. We’ve had some other guest too. I’m very much thinking about the things we have coming up because we’ve been presenting topic ideas to people. We’re going to do tools and technology. We’re going to do how to be organized when your life is insane. How to break through and deal with the important, not the urgent, to deal with your big rock stuff. Rob: Sign me up for that one. I’ll be there. Amy: We had a lot of enthusiasm on that one. I’m going to try and just keep doing topics, or having guest come in on topics that seemed relevant at the moment, what are people dealing with. Then if we’ve got multiple topics like we do this time, we’re giving people a choice. Then I think we’ll do some New Year kinds of things in 2019, maybe some goal setting or some planning. I’m into short-term goals. Maybe we’ll do a first quarter goal, and see if we can move the needle for some people in that year too. Kira: We are a partner. We’ve partnered with you on Copy Clinic because we believe in what you’re creating and the back story is really that Rob and I tried to create something similar and we just didn’t have the bandwidth to do it and then in the meantime, you had created something that you presented to us and just looked really perfect especially for the needs of a lot of The Copywriter Club members. We should say that that we stand behind what you’ve created and really believe in it because it’s helped … At least for me, it’s helped me greatly to partner with you on projects and work directly with you and learn from you before you even created The Copy Clinic, but just through projects actually. I miss working with you on projects. I feel like we need to do that again, but how important it is to continue to get feedback on your copy, and your business like you said, you’re providing both, and covering both. What would you say … I mean, why is this really important, and even important for copywriters who aren’t newbies, and maybe they’ve been at it for a year or more. Or maybe even five years, and they’re like I don’t need feedback. I’ve been doing this for a while. Why is it so important that we continue to get feedback on our copy especially? Amy: It’s a great question. It’s interesting because this can be a hard thing to talk about because it does feel somewhat esoteric sometimes. What’s the hard thing that you’ll get out of this? We may get that out but I think what’s important about it, and actually I don’t think it matters if you’ve been doing this for a year or even been doing this for 10 years or more. It’s almost impossible to get perspective on your own work, it just is. especially if you’re doing either a long or a complicated project with a lot of parts, it can be really overwhelming and it can be hard to sort out, and keep perspective because you’ve got a lot of things you’re managing in a project. You’re doing management, you’re doing the client management. You’ve got your research, you’ve got your copy. If it’s a big project, you may have other people working on pieces of it. There’s a lot to deal with, and the longer the pieces, the longer you work on it and probably the more little tweaks and adjustments you’re making, and there comes a point … I mean, tell me if this doesn’t happen for you guys where you just have no clue anymore. I mean, you can’t see it, you can’t read it. The only hope for it is maybe you put it down for three or four weeks, which you don’t have the luxury of. It’s one of those things. I mean, somebody can come in with outside eyes who has enough experience to know how to do this and help you just see what you can’t and make improvements and strengthen the copy. I mean, that goes for me too. I mean, I can write a piece of copy, and Kira you can come in or Rob and see things I would never see. The other piece of that is sometimes you can elevate the ideas. Rob might look at a headline I have and say, ‘If you did this or did that, or maybe if you shortened it, where’s the you or you’re in here?’ The thing that I may just totally missed, but he sees in a heartbeat. It’s super helpful that it makes the copy work. I think just that perspective. It’s not something that we talk about, so I think we all feel to some extent, ‘Oh, I should be able to do this alone.’ I think the other side of that is people feel a little self-conscious, vulnerable to show their copy. I try and just be really kind, and always find what works. Honestly, for most people they’re better than they think they are. They’re not worse than they think they are. They come to The Copy Clinic, sort of hangdog and they leave sort of standing up tall like, ‘Oh, I’m pretty good at this. I didn’t know.’ That’s a really good benefit. Rob: This membership community is full of copywriters that are investing in their businesses and it’s taking what they do seriously. Everything is focused around three ideas, copywriting and getting better at the craft that we all do, marketing and getting in front of the right customers so that you can charge more and earn more. Also mindsets so that you can get out of your head, and focus on the things that will help you be successful at what we do. There’s a private Facebook group for the members of the community and we also send out a monthly newsletter that’s full of advice, again, on those three areas, copywriting marketing and mindset. Things that you can markup and tear out, put them in your file, save them for whatever and it’s not going to get lost in your email inbox. Kira, what do you like about The Copywriter Underground. Kira: I love the monthly hot seat calls where our members have a chance to sit in a hot seat and ask a big question or get ideas, or talk though a challenge in their business because we all learn from those situations. Then I also feel like the templates we include in the memberships we include in the membership are valuable because who wants to reinvent the wheel. Rob and I end up sharing a lot of the templates and resources we use in our own businesses so I would definitely want to grab those. Rob: If you are interested in joining a community of copywriters that are investing in a business and in themselves and trying to do more, get more clients, earn more money consistently, go to thecopywriterunderground.com to learn more. Now, back to the program. Yeah, I like that a lot. Because you’re reviewing so much copy, let’s talk a little bit about the mistakes that people are making as well. It’s awesome that people walk away thinking, ‘Yeah, I’m better than I thought I was or I’m actually really good at my job, but you’re seeing all kinds of things that people are missing or things that they could do to improve. I’m not sure that there’s maybe a top five list or anything like that. What are the biggest mistakes that people make over and over, and over in the copy that you see as you coach them. Amy: Just before I say that, I just want to say when people do get that standing up tall and feeling good, it’s like that’s what allows them now to go forward and improve the copy because before they were like, ‘Oh, gee. I don’t even know if I’m good and I shouldn’t show this.’ That’s not like a be all and end all. That’s the beginning of, ‘Oh, I could do better, and I could be a real pro.’ The things that I see a lot is I see too much copy, and I see copy that doesn’t … It’s not crisp. It’s not crisp or it doesn’t pass what we use to call the breath test, if you can read the sentence and not run out of breathe, and not too short. If you run out of breathe, it’s too long, and a lot of it, and you’re panting at the end. Big chunks of copy. You know what I see is a lot of little explanation copy and what that really means, and so that. Stuff that just like if you cut it out, it suddenly crisps up and it has momentum. I think what happens is people feel this need to, I don’t know, explain in copy, like literally explain instead of using the copy techniques to describe. The thing I see the most is a lot of rambling and a lot of unnecessary copy. The other thing that really surprises me, and maybe it shouldn’t because I’ve seen this in my own copy is really disorganized copy, and I think that comes from losing perspective. Maybe the vast majority of it is ripe, but there’s something missing or there’s something in the wrong place or you have all the concepts, but they’re just not organized following PAS, or AIDA, or pace opera, any of the formulas. It’s like you have all the pieces are in there but they don’t make that logical argument. That’s a good one because it’s pretty easy to fix and it’s a relief because you start reading through something, and you think, ‘Oh, this just doesn’t work.’ Then you find out, ‘Well, it’s all here. It just doesn’t work because it’s not put together correctly. Another thing that I see a lot is people are pretty weak on CTAs, and it’s almost like … It’s interesting. You know how we use to talk about. You write the close first and then you write everything to the close because you know what the close is? It almost feels like people are forgetting about the close. It’s telling you about the thing and there’s no opportunity to get the thing, or in getting the thing, it’s really weak. It’s like, ‘Okay. Click here.’ It’s like, ‘Oh, no, no, no.’ That’s a thing. Then speaking of that, the other thing I find is there’s a lot of feeling that the length of the copy is determined by the price so that people think if you’re selling something that’s a really low price point that people won’t commit much to that. They won’t commit time to reading about it. If it’s a higher price point that you need a lot of copy to sell it, and really what we know is that it’s really dialed in to people’s state of awareness and levels of sophistication, not the price of the product. Sometimes it’s actually easier to sell something that’s a higher price. We’ve had a lot of discussions about that like me trying to convince people that it’s really worth writing a full-blown sales page for a $19.95 product or a $47 product or whatever it is especially if it’s part of an ascension funnel, but I personally love that. You’re reading through something. You want it so badly and you’re like, ‘I’m sure, I’ll never be able to afford this,’ because they’re making some of this big argument and … Excuse me, making you really want it and you find out it’s really affordable. You just buy it instantly. We had a lot of conversation about that. People think Direct Response is hypey and salesy and they’re afraid of it. I think the same they’re like it’s that same thing. It’s like closing the deal, or asking people for the sale. There’s a lot of grittiness in there for people. Kira: How have you seen long form sales pages shift over the last few years, if they have? Amy: Interestingly, it seems like they’ve gotten more concise and some of it has to do with the UX, with the user experience. It feels to me a little bit like web design has caught up more with these long form sales pages because they’re more commonly easy to read and easy to get into. It seems to me that we’ve used more graphic diversion than we used to even a few years ago just to keep people in because they’ve become more … I don’t know if sales letters should become more ubiquitous but I don’t know. I guess there’s a feeling every year that people are getting more and more messages put in front of them that we have to get better and better at what we do. I think that’s probably been true forever. I think the digital world just makes it feel like it’s happening all that much faster. It seems to me that they’re … Do you see that too with UX and how things are laid out and presented? Kira: Yeah. I find that I’m paying a lot more attention to mobile and even if my clients aren’t, but I need to keep drawing my attention back to mobile and UX. Amy: I think that’s the biggest thing. For me just working on so much copy, I feel like … It’s like my contribution to helping tighten up the copy that’s out there in the world. My little teeny sliver. Rob: Amy, one of the things that I’ve heard you talk a lot about is the client conversation and how you manage back and forth with a good client and really it all comes down to a lot of ways building your authority with your client. What do you have to say to a copywriter who’s looking for ways to build their authority or to look more impressive or to get in front of the right clients? How can you help that person out? Amy: Yeah. How do you help that person out? Foundationally, I believe that to build a professional business, you have you put a stake in the ground. You have call yourself whatever you are, a copywriter, or a consultant, or a strategist. One of the reasons that that’s important is because copywriting is a funny business because you have people that use copy but don’t understand copy. It’s important for clients to understand that you’re not just someone who executes but someone who can strategize and execute. Most copywriters can, and when copywriters start seeing that … It’s hard to write good copy without being a marketer or without understanding marketing, and even if you’re a content writer. I think that copywriters need to somehow put on their business hat because when you command in respect of the client, you have to run the show, and that’s the really good clients, the high paying clients. Not all good clients are good clients because they’re high paying clients. I mean, some people they pay well, and they’re great to work with. It’s not all about the money necessarily but good clients who respect your work, who give you autonomy, who trust you they want someone who’s turnkey. Think of yourself. Anybody listening that hires anybody for any service, if you trust that person, and you feel confident in them, then you’re relaxed because it’s off your plate. You don’t have to worry about it. You’ve called this expert. You know they’re going to handle it. If you don’t know the expert is going to handle it, then you stress about it and it doesn’t really help you. If you can’t completely let go of something and it’s still in your plate, the job isn’t completely done. Even if you’re not aware of that as the client, you’re not going to feel like you want to work with that person again where on the other hand, if somebody really controls the situation and you feel like they have a process and you’re in good hands, you can let go some more. The way that that happens though, it starts from the very beginning. I mean, it literally starts with controlling the prospecting conversation however it starts whether it’s by email, by video, by phone. You want to be in control and not just be an order taker like, ‘Oh, yes. I’ll do that, and I’ll do it at your price,’ and whatever it is. It’s you really want to know the questions to ask to establish your authority. Some of that comes from confidence, but interestingly some of it comes from what we were talking about earlier with any kind of advance in your business. It’s making a plan and sticking to it. I’ll have people come up with their script or whatever they’re going to use, and then they’ll practice it and perfect it. Lo and behold, it’s like they go from like, ‘I could never control the conversation,’ to ‘Hey, if I just use this kind of language, even if I don’t feel 100% comfortable, it works and that makes you feel more comfortable. Before you know it, you’ve leveled up what you’re doing. That was a detailed answer, but I think it really comes back to knowing these things and then committing to them, making a plan and then following through on it. Sounds so simple, doesn’t it? Rob: Yeah, when you say it like that. Kira: It’s taking me a while to work on that piece of it, but even this week, I had a project, our client that I felt like was starting to get a little out of control with communication, and I didn’t like it. I think it’s about resetting expectations and we are the one who has to do that. No one else would do that in the project. It’s good to get to a point where you feel confident when you can jump in and reset expectations and say, ‘Here’s how things are going to go. I’m taking the reins.’ You don’t have the reins. It’s such a great feeling, but it comes with confidence and experience, and working with people like you. I’m curious to hear about how you have built your authority over the last year, and it’s slightly different because it’s more about stepping into the coach space which you been in for a while but really owning that space as a mentor coach and everything else that you have become in the last few years. What have you done to really get out there? Amy: I’m in a funny position, and a really lucky position I think, fortunate position, and part of it is just because I’ve been around a long time, but I feel … This is going to sound strange, but I feel really fortunate like I get to work with you two. I’ve gotten to work with Kevin Rogers. I get to work with Joanna. I have gotten to be visible in spaces with those three groups where you guys have really worked hard to build your authority and are really respected. We happen to be colleagues. That’s just been really fortunate for me, but the other thing that I’ve done is I’ve really tried to make as many connections as I can and be as help as I can. Actually, I really enjoy that. It’s funny because I’ve been talking about this lately and it feels corny to say I really like helping people, but I actually really do. I get really energized. If I give somebody something that makes them feel like, ‘Oh, I can go out and do this now.’ I feel good. It gives me energy. I guess that’s been the thing that’s really worked for me is to just put myself out there and try and be helpful. That is included when people reach out to me. I mean, I respond to everyone. I will take the time, I don’t know that I can continue to do it but I’ve taken the time to hop on the phone with people or give them some advice to the extent that I can or look at their copy and make suggestions. That’s how I’ve been doing it. Rob: I love what you’re talking about here because this is something that Kira and I talk about a lot and in a lot of ways, it’s just about getting in the right rooms with the right people. Amy: Exactly. That’s hard to figure out what are your right rooms, right? Where do you want to be, and where do you want to plant yourself? It’s funny though because I have done much better like going to copywriting conferences and making, of course that’s my market now but even just making connections with copywriters for clients that I have going to industries, specific for marketing conferences. The group that has copywriters is just like … It’s an incredible resource. Rob: For sure. Amy, I’m curious where you go from where you are now, what’s next for you. Is it just more of the same, or is your business going to continue to evolve? Amy: Yeah. It’s going to evolve. I am going … I have decided in 2019, and I’ve got to figure this out, how much I can do this, but I’m going to hire myself to the extent that I can either for the first quarter or for a good chunk of the first quarter. I want to get started on productizing some of this knowledge and information to make it accessible to people probably in product form like in course form. That’ll serve me because I’ll be able to serve more people and I need to get off … I need some leverage. I need something that’s going to work for me, that doesn’t involve my direct input of hours. Kira: Amy, so how are you managing all of this answering all your emails which I definitely don’t do taking phone calls, managing multiple programs that are intense, time intensive, running client projects. What does your business look like behind the scenes? Amy: It’s interesting. I was managing it really well up until the last couple of weeks, and I’d say how we’ve been managing it is poorly. What’s really helped me, and this happens. This is like part of the trajectory of business and this thing we always talked about entrepreneurship is like you have to have time to work on your business, and just not in your business, and when you stop making that time, you really feel it and things start to fall apart a little bit. At least they do for me. The way that I’ve handled that is hiring. I had contractors. I have an assistant who does a lot for me, and now I’ve just brought on somebody else which she does for me is more administrative … I mean, technical. She does a lot of my … All of my tech stuff, but now I’ve got somebody who’s more on the copy side. I have someone helping me with client research. I actually have people … I have other people working on projects with me. That’s not a model I believe that I will continue for a variety of reasons. I take in the same amount and even a little more, but I’ve got a bit of a team. That’s how I’ve done it. I don’t have it dialed in perfectly. There’s definitely some changes I have to make, but it’s the way that I’ve managed to at least scale and roll a little bit. Rob: I’m actually curious now that you’ve brought that up about when you say you might not be continuing forward on some of these things. We’ve talked with others in the past who are trying to build this micro agency. you’re working with contractors. We’ve talked with some who have done it and didn’t like it and so they pulled back in their business. I’m curious what are the challenges there that are making you think maybe that’s not the direction I want to go. Amy: No, for me the challenge is hyper-responsibility. I can’t let go. I just can’t. I just feel this sense of responsibility to the client. The way that I’ve positioned it is clients know that I’ve got somebody working on the project with me. There are people who are talented and capable, and I’m having them interact with the clients but I’m still finding that I feel I’ve got that thing in the back of my mind. What’s happening with that project? Has she done this yet? Has she done that? Will she do it? I’m sure working with people over a longer period of time, that would be more predictable. I feel like if I can’t let go, then I’ve got the weight of that whole thing, and I can’t. You can only have so many of them so if I’m doing projects that I’m working on solo, and I’ve got two of those, and I’ve got three of these projects out, it’s more than I can handle. My brain just gets overloaded. Kira: Yeah, definitely. I felt that weight before so I know what you’re talking about. Before we wrap, can we talk about where copywriters can go if they’re interested in The Copy Clinic? Amy: Oh, sure. Yeah. Of course. There’s a page up, an informational page of Copy Clinic at my website which is Amy Posner, A-M-Y-P-O-S-N-E-R.com/copy-clinic. I think if you go to amyposner.com, come to think of it, there’s a banner at the top right at the moment for Copy Clinic, so super easy. Rob: Amyposner.com is where they should go to find out more about you. Amy: Right. That too. Actually, one more thing about it. The way Copy Clinic works is it’s not … Because people have said to me, well, when do you launch it, and how do I get in? It’s a rolling seat if you will. I think of it like a conference table and someone might sit at the table for six months and then go off on their own. Now, there’s a seat open and someone else can get in. Right now we have a few seats open? That’s how it works. You can in fact come and go if there are seats that are available. It’s not a program that has a start and an end. Kira: Can you just remind us one more time of what they get when they opt-in and join? Amy: Yeah. Copy Clinic meets three times a month in groups of eight. There’s two groups of eight to … To keep them small, I also do accommodate time zones because we have people from all over the world. We meet three times and in those sessions what we’re doing is we’re going over copy that people have submitted and that I have reviewed and marked up. Every week, when people submit copy, they get a marked-up document back with comments and the reasons for comments and the potential or suggested changes, so they get that, but inside of the session, we will actually go over some of those. Like I was saying earlier, now we go over them from the point of view of a copy principle. Why is this important? Why would you do this here instead of that? Then that can get us into a conversation of almost anything, but usually the state of awareness and the prospect, and the one reader, and how well we have it dialed in and that sort of thing. Then we’ll also talk … Those are the sessions where people will bring client concerns or questions and what’s nice about it is almost everyone has the same ones and different forms, so it’s good for people to hear what other people are going through. That happens three times a month and those sessions are an hour-and-a-half. Then once a month we have a special guest speaking on various topics that are related to what’s going on with people at the moment. Then there’s two other things. I do office hours, so once a week in Slack during the weeks that we meet, those three weeks. There’s an hour on Fridays for office hours where I’m just in there answering whatever. Questions come up or if people have iterated copy during the week, they want me to look at it during that hour, I can do that. Amy: The other cool thing, the final thing is that we … That Slack group has morphed into a really nice community of people popping in and helping each other and answering questions. That was something I hope would come out of it, but wasn’t sure especially with the rotating seats. It’s been a really good group of ambitious cool people to hang out with, so that’s it. Rob: That’s awesome. Thank you, Amy for coming in to the studio again and sharing what’s going on especially about Copy Clinic. We encourage anybody who’s interested in that to check it out. Kira: Yeah. Thank you, Amy. Amy: Thank you, guys. Before we go, I just have to say hats off to you guys on The (Copywriter) Underground You have created an awesome, awesome membership space so congratulations you guys. Kira: We’re glad that you’re in there too, and you’re active in providing a lot of feedback and support in that group so thank you. Amy: You guys didn’t think you’d go underground down a hole, and I wouldn’t follow you. Kira: We were just waiting for you to show up. Perfect. All right. Thank you, Amy. 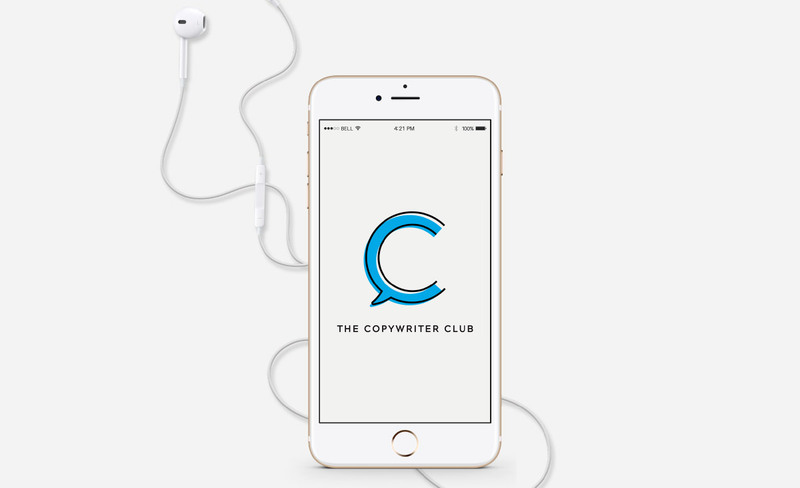 You’ve been listening to The Copywriter Club Podcast with Kira Hug and Rob Marsh. Music for the show is a clip from Gravity by Whitest Boy Alive, available in iTunes. If you like what you’ve heard, you can help us spread the word by subscribing in iTunes and by leaving a review. For show notes, a full transcript and links to our free Facebook community, visit thecopywriterclub.com. We’ll see you next episode.